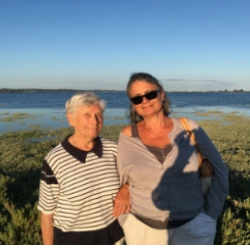 This is a special testimonial from our French branch to raise awareness for Alzheimer's. Five years ago, Elisabeth (@ztg4475) was the first person to notice that her mother was behaving unusually. Neither her family nor her mother wanted to believe that she had developed Alzheimer’s disease. Today, at 88 years old, Elizabeth’s mother still lives in her own home, thanks to the determination of her daughter. How did you come to suspect that your mother had developed Alzheimer’s? I began to notice small changes in her behaviour. First of all, there was an air of nervousness around small, daily tasks: my mother was constantly fidgeting with her keys or small pieces of paper. I also noticed that she began to lose track of time and would mix up dates as well as forgetting to attend appointments. She would ask me the same questions several times and became obsessed with tiny, inconsequential details that would go around in a loop. She forgot how to do everyday tasks, such as tidying the shower gel or tying her shoe laces. Finally, she was forgetting if she had eaten or what she had seen on the television the day before. Did your friends and family agree with you? Apart from my daughter, who is very close to her grandmother, our family thought that I was exaggerating. My mother who was, and still is, capable to joke and to have a conversation that would seem normal to those that didn’t know her very well. How did your mother react when you spoke to her about Alzheimer’s? She became very angry and blamed her behaviour on being tired. I really had to insist that she went to the doctor, I would shout and we would argue and finally she agreed to visit the Alzheimer’s unit of our local hospital. How was the process of the diagnosis? The diagnosis was made by geriatrician in our hospital. We visited the geriatrician together and I filled out a questionnaire while my mother stayed alone with the doctor. My mother did some classic examinations (tension, etc.) as well as a test that lasted about one hour and thirty minutes with a psychologist. Did you feel like the health care professionals really listened to you? Yes, and truly that is very important! How do you manage daily life with this disease? What are the main difficulties? I try to be patient, even though sometimes it is very difficult. On the other hand, she no longer gets angry with the situation. She understands now that I am doing these things for her well-being, to insure that she doesn’t go into a retirement home, and she thanks me often. What advice do you have for someone who suspects that a loved one might be suffering from Alzheimer’s? You really need to put pressure on them to go to the hospital to do tests. What advice do you have for someone who is taking care of someone with Alzheimer’s? When making the diagnosis, you have to listen to your own intuition and no one else. You need to find a hospital (or equivalent) that is highly trained to form a team with the patient and their relatives. At the onset of the illness, you need to find effective and practical ways to keep the patient at home for as long as possible, such as encouraging them to have a morning routine that they do each day. Don’t hesitate to be resourceful and creative! Although it may seem a bit ridiculous at first, I write a lot of things to my mother on small pieces of paper: the dates of appointments but also the jobs of my children, deadlines like Christmas, etc. Thank you for your testimonial which I found interesting. My mother also went through the same symptoms last year, went into a hospital and was diagnosed with Alzheimers. She refused to take her medication and it was difficult to control her at one stage due to her stubborness etc. I never understood why. I was invited to attend an Alzheimers Awareness programme some months' ago, and was determined to go and find out more information on the subject. Thank goodness I did, as I wasn't aware of half the facts that can occur with this condition. Even though my Mom lives so many miles away, I ensure I keep in touch with her once a week; I try and understand what she is going through, but just wish I was closer in distance to help her! Thank you ofr sharing that with us. Alzheimer's is truly a difficult disease and it is so important to become educated about it in order to help others and yourself. Thankyou for your testimonial. I am looking after my mum who is 85 and has Alzheimer's. She is living in sheltered accommodation with a part time warden. My sister is her main carer. I look after mum one day a week. We cook all her meals for her. She is still very sociable and appears to be happy. Sometimes she gets frustrated about her poor short term memory saying" If I had a brain I would be dangerous. " We try to reassure her and encourage her in her social activities. @Hidden username Thanks for sharing your story Anna, you and your sister sound like amazing daughters. Welldone on being such an aid to her.